This is your chance to enroll in English 10 at highly rated Hellman College--if you can find a place to sit in the fantastically overcrowded classroom. Mark Sternum, whom readers first met in Downing's beloved novel Perfect Agreement, is a veteran teacher. Twenty years older, separated for six months from his longtime lover, and desperate to duck the overtures of double-dealing deans above him and disgruntled adjunct faculty below him, Mark has one ambition every day he is on campus--to close the classroom door and leave the world behind. His escape, however, is complicated by his contentious, complicated wrestling match of a relationship with the Professor, the tenured faculty member with whom Mark has co-taught this creative-writing workshop for ten years. The spectacle of their rigorous, academic relationship is a chance for students--all of us--to learn what an amazing arena the classroom can be. 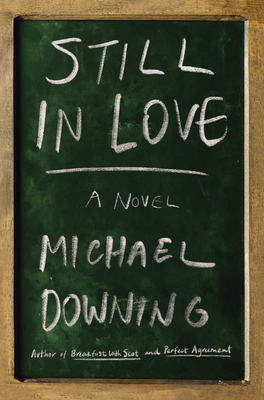 Replete with engaging writing exercises, harsh criticism, and contrarian advice, Still in Love is the story of one semester in a college classroom. And it is an urgent reminder that we desperately need classrooms, that those singular, sealed-off-from-the-world sanctuaries are where we learn to love our lives.